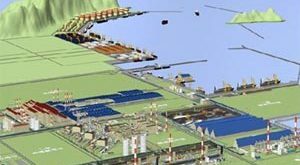 Prime Minister Nguyen Tan Dung has given the nod to a US$2.5 billion seaport project in Ca Mau Province proposed by the Ministry of Planning and Investment and the Mekong Delta province. The province has been told to complete procedures for the Hon Khoai seaport project while the ministry will assist the province in appraising and approving the project as well as moving on to the next steps of the project to be implemented in the public-private partnership (PPP) format. Ca Mau said Hon Khoai has been zoned as a national general port able to handle what are currently the world’s biggest seagoing vessels. Earlier, Ca Mau asked the Prime Minister for approval of the Hon Khoai port and for offering a no-bid contract for Cong Ly Construction, Trading and Tourism Co. Ltd. to develop the project, VnEconomy reports. The planned port would be located on Khoai Islet, around 17 kilometers off mainland Ca Mau Province and 42 kilometers from Nam Can Economic Zone. A breakwater, piers for vessels of up to 100,000 DWTs and tugboats, and a bridge connecting Sao Islet and the shore of the province would be built as part of the project. The investor is expected to use its own funds to cover 15% of the US$2.5 billion needed for the project and borrow the remainder from the Export-Import Bank of the United States (Ex-Im Bank) to carry out the project in 2016-2020. According to the government of Ca Mau, the port would be of great significance to development of Nam Can Economic Zone and to the nation’s security and defense when it is put into operation. Minister of Transport Dinh La Thang has issued a decision approving a plan to dredge and upgrade waterways between HCMC and the southernmost province of Ca Mau to facilitate cargo transport between the country’s southern economic center and the Mekong Delta region. The ministry is pinning high hopes that development of inland waterways would help ease rising cargo transport on the road, particularly between HCMC and the Mekong Delta region. Under the plan total cargo transport by different means would amount to 93.5 million tons by 2020, an average annual increase of 7.7% in 2016-2020. Of the total volume, 62.3 million tons of cargo, 66.83% of the total, would be handled by inland waterway, 25.3 million tons (27.1%) by road and 5.67 million tons (6.07%) by sea. To realize the targets, the ministry will spend big on waterways between HCMC and Ca Mau to facilitate the operations of barges of more than 2,000 tons, upgrading Xa No Canal and the Dai Ngai-Bac Lieu-Gia Rai sea route, modernizing large river ports for containerized goods including Binh Long in An Giang Province, An Phuoc in Vinh Long province and Long Binh in HCMC, and building Cai Lay river port in Tien Giang Province. Investments will also go to developing container vessels and improving the handling capacity of containerized cargo at river ports. Relevant agencies will carry out the second phase of an upgrade project to dredge and expand Cho Gao Canal to 80 meters for container barges to make their way up to river ports. The ministry will put into use a sea route between the south-central coast province of Binh Thuan and Kien Giang Province and linking ports in HCMC, Tien Giang, Can Tho and Ca Mau. Vessels of over 1,000 DWTs in the initial time before ships of 2,000-4,000 DWTs are put into service on the route. The Hau River will be dredged to enable vessels of 10,000-20,000 DWTs to operate to meet increasing demand of localities for cargo transport and export. The ministry will upgrade Quan Chanh Bo Waterway for vessels of 10,000-20,000 DWTs, Dinh An Waterways for vessels of 5,000-10,000 and the waterway via Bo De Estuary for 3,000-DWT ships. The ministry will seek investors to develop Can Tho Port into a hub for the Mekong Delta region and a number of major ports including My Tho and Nam Can to handle 4,000-DWT vessels. The Government has issued more incentives related to land rent, taxes, fees and bank loans for investors of ports, shipping lines, corporate cargo owners and maritime transport services providers. Enterprises are also encouraged to invest in container terminals and cargo handling equipment. 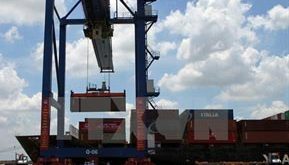 The Government has called for enterprises to develop ports along inland waterways and sea routes and cargo warehouses and distribution centers in Tien Giang, Can Tho, An Giang, Kien Giang, Ca Mau and HCMC. The ministry will impose stricter controls on overloaded vehicles on roads and heavy fines on violators, particularly on HCMC-Trung Luong Expressway and national highways 1A, 50 and 61. These roads are expected to facilitate cargo transport to river ports in Can Tho, An Giang, Ca Mau and Kien Giang and major goods distribution centers in the region.